This is my favorite Vine of all time forever. So this guy, Anthony Rendon, he plays baseball for the Washington Nationals, and he is good at baseball, and he hit a home run in a game against the Philadelphia Phillies last night, and that home run hit some bald guy in the head. 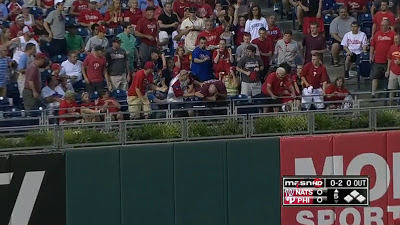 The baseball that Anthony Rendon hit with his baseball bat went far, like over 350 feet, and fast, like probably faster than a particular bald guy in a Jimmy Rollins jersey thought it would be traveling. And then that baseball hit that particular guy's head, and then the baseball kept traveling for like another ten feet. This is the basic information anybody needs to know about what happens in this Vine. In baseball if you hit a home run that's a good thing. It means your team gets to score at least one run. Automatically. Without all that running and trying not to get tagged out by anybody. If you hit the ball too far for somebody on the other team to run and get it, you get to run all the way home. A home run. It's great. You might have heard people get excited about it when it happens. "It's a HOME RUN!" they exclaim in surprise and delight. A home run is an accomplishment. It's hard to hit a baseball that far with a baseball bat. This Vine has a home run in it. Sometimes people get bonked on the head in an unusual way. It's not good when that happens, but when it happens to somebody else other than you, that sometimes makes you want to laugh because you're so relieved that your head is safe and not currently bonked. If they don't die or suffer a traumatic brain injury, it's okay for you to think this is funny. Plus, if somebody gets their head bonked in an unusual way they could have prevented by not being stupid, say by moving their head out of the path of a ball that traveled over 350 feet or blocking that ball with their hands or something before it could hit them in the head, that's kind of extra funny. Like "not only am I relieved that my head is not currently bonked like that guy's head is bonked, but I'd like to believe that in that guy's shoes I would have reacted differently and therefore my head would not have been bonked. I will feel free to laugh now." This Vine features a guy getting bonked in the head in an unusual and stupid way. I like the Vine because of those two things in it. Those are two entertaining things. I like the Vine even more because of some more personal factors. One of those personal factors is that I'm a fan of the Washington Nationals baseball team. I like it when they do good baseball things like hit home runs. This is not just any home run. This is a Washington Nationals home run, my favorite kind of home run. I like that. Another personal factor that helps me like this Vine a lot is that I am NOT a fan of the Philadelphia Phillies baseball team. There is a thing in sports called a "rivalry" where you like one team and your team plays another team often, and sometimes that team beats your team, sometimes often and by a lot, and you think, "Man, I don't like that other team. Anything bad that happens to them makes me happy." I feel that way about the Phillies. And this video also features the Philadelphia Phillies pitcher throwing a pitch that a Washington Nationals player, Anthony Rendon, hit a home run of. That's a BAD thing to have happen for the Phillies. I like that. Even one better thing about this video is that the bald guy who got hit in the head by that home run: he is a fan of the Philadelphia Phillies. I don't like fans of the Philadelphia Phillies. The reason why I don't is complicated, but it can be summarized like this: I often don't like groups of people who have displayed a higher-than-average tendency to intentionally puke on eleven year old girls. Which, okay, is unfair, because only one guy did that ever, but you know the old saying. "Intentionally puke on my eleven year old daughter once..." Philadelphia sports fans have over the years refined their own particular brand of awfulness, and they have very often intentionally aimed it at the Washington Nationals baseball team. I do not feel at all guilty about not liking Philadelphia Phillies fans as a rule, and then making individual exceptions as they present themselves. As a result, when something bad happens to a Phillies fan, generally, I like that, and I like it even a lot more when it's a Phillies fan getting bonked in the head in an unusual way, and I like it even more if that way is a home run that somebody hit off of a Phillies pitcher, and I like it even more than that when that home run was hit by a Washington Nationals player. I like this Vine, like, way a lot. Also: this Vine is a Vine. So it's a short video that plays on a loop over and over. Rendon hits a home run, and then it hits the the head of bald guy who is wearing a Jimmy Rollins jersey to indicate that he is a fan of the Philadelphia Phillies, and then the video replays and it hits him again, and then his friend checks to make sure he isn't dead, and then it hits him a third time. Then it loops and starts over again. 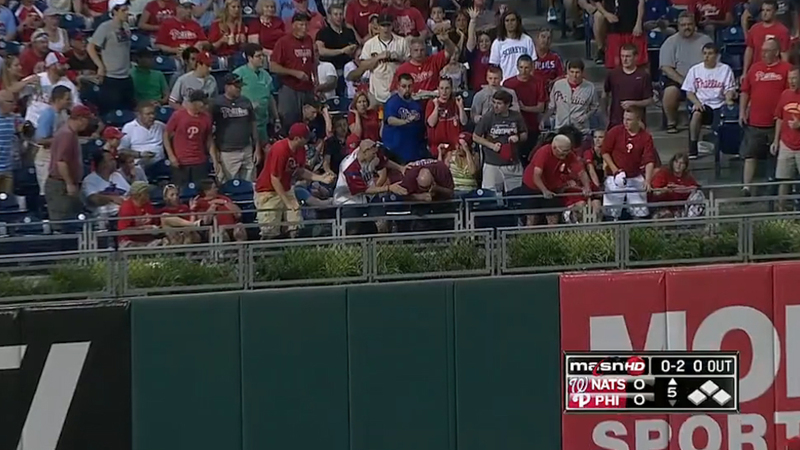 Rendon hits the ball, ball hits the guy, ball hits the guy, pause, ball hits the guy. The fans around the guy are concerned. One of them is not concerned and just wants the ball as a souvenir. The announcer says "He hits one hard it is out of here 's out of here. [pause] Is out of here." Over and over. I like all of the things that happen in this video. I have been watching it nonstop all morning. It is my favorite Vine of all time FOREVER.